Pioneer has announced its latest hi-def home cinema system, the LX01BD, which incorporates a Blu-ray player and some nifty new speakers. Unfortunately the Blu-ray player is just Profile 1.1. This means that you won't be able to play BD-Live special features. Which, at this moment in time, is no bad thing. The player does offer 1080p resolution and has HDMI Deep Colour support and two HDMI connections. The audio kit comprises an integrated 5.1 channel amplifier and features two combined front/centre speakers and two rear speakers. And also included is a subwoofer-receiver with dual-drive subs. 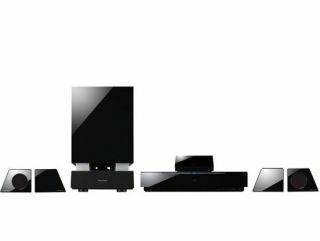 The kit has been specially designed to fit in with Pioneer's KURO TV range and features KURO Link, which enables you to control the system via your TV's remote control. There's no word on availability or price, but keep checking Pioneer's website for details.